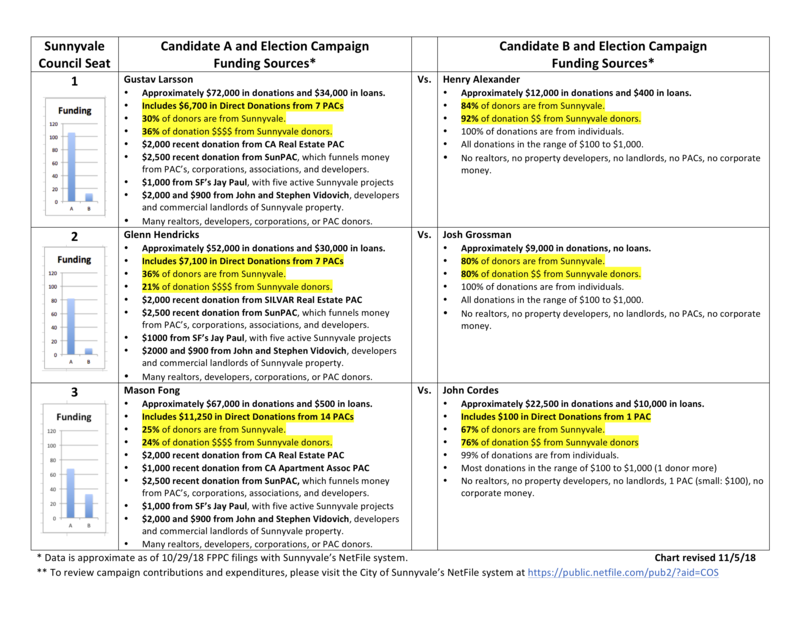 Part 4 Follow The Money / 2018 Sunnyvale Council Races (10/30/18, Rev 4D revised 11/5/18) begins with an updated financial summary sheet for 2018 Direct Council Funding then reviews PAC Direct Donations that candidates have accepted and PAC Independent Expenditures made in support of individual council candidate campaigns. 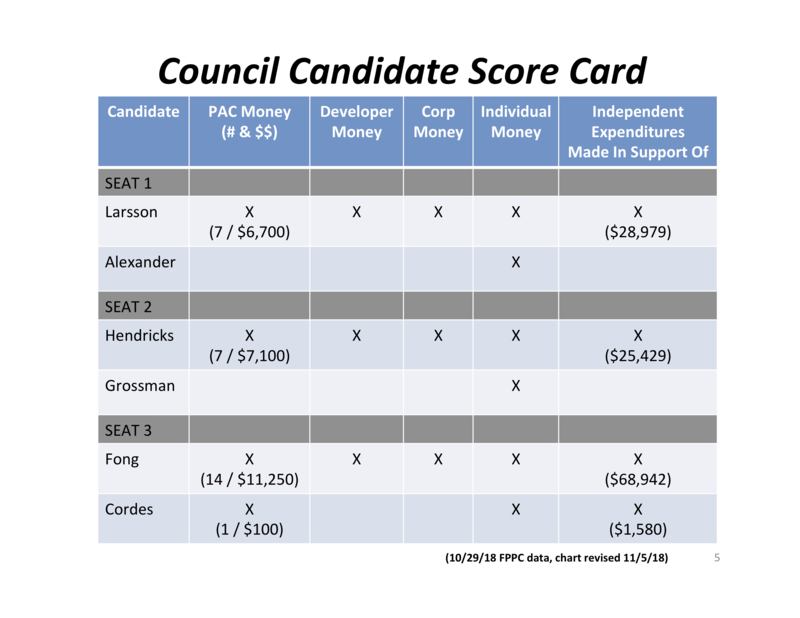 A Council Candidate Score Card identifies which candidates have accepted PAC, Developer and Corporation monies, as well as Individual Donations, and finally whether Independent Expenditures (such as PAC funded mailers, ads, phone banking etc.) have been made in support of their campaigns. The Score Card reveals the candidates with full dance cards, i.e. those with all the boxes checked! Part 4 wraps up with a discussion of “Why So Much Campaign Funding?” and a reminder that they, the VOTERS, elect Sunnyvale’s city council – not PACs, Corporations and special interests. Following Part 4 are additional related comments by Eric Krock. Please see http://www.sunnyvalepubliclandsact.com for Parts 1 through 3 of this series. Part 3 Follow The Money / 2018 Sunnyvale Council Races (10/16/18) looks at campaign funding concepts, the funding sources of Sunnyvale election campaigns and the effects these funding sources have on Sunnyvale’s municipal elections, selection of city council members and the council and city decisions. The 2018 Sunnyvale city council race campaign funding is reviewed showing a dramatic contrast between those council candidates who are primarily supported by Sunnyvale donors and dollars and those who are primarily supported by out-of-town sources, PACs, Developers and Corporations. Asks Sunnyvale voters to consider which council candidates will best support their families’s goals, quality of life and a well run Sunnyvale. A Sunnyvale community update series: “2016 Sunnyvale Measure M Election and Funding Report” is presented at city council Oral Communications starting with the June 26, 2018 meeting. Parts 1 and Part 2 of the series introduces voters to a recap of the 2016 Measure M election, the campaign financing and players involved, explores Transparency, funding of city council campaigns, Donation Laundering plus perceptions of the effects of Big Money interests on Sunnyvale and closes with proposed potential solutions to help steer our elections in a new direction. Pointers to videos and slides are below. Introduces voters to a recap of the 2016 Measure M election, the campaign financing and players involved. Slides: Part 1 – Click to view or download slides. Looks at Transparency, an example PAC’s direct city council funding and explores Donation Laundering and Big Money Direct and Independent Expenditure donors. Part 2 wraps up with perceptions of the effects of Big Money interests on Sunnyvale and proposes potential solutions to help steer Sunnyvale’s elections in a new direction. Slides: Part 2 – Click to view or download slides. On May 22, 2018 the Sunnyvale City Council held 18-0449 a SPECIAL JOINT COUNCIL AND PARKS AND RECREATION COMMISSION MEETING (Study Session) to propose use of a council-only-approval Ordinance to amending Chapter 2.07 (Purchase, Sale or Lease of Real Property) of the Sunnyvale Municipal Code as a response to the 2016 Measure M citizen initiative. The agenda item and staff presentation is here 18-0449 Click here for the Study Session Video (duration 50 min 55 sec) including public comments. On June 26, 2018 the Sunnyvale City Council adopted an “Administrative” response to the 2016 Measure M citizen initiative. The council declined to put the amendment before the voters of Sunnyvale. By a vote of 5:2 the council approved the ordinance amendment WITHOUT VOTER APPROVAL provisions. With this council-passed amendment to Chapter 2.07 a list of defined PARCS properties can be sold or leased WITHOUT VOTER APPROVAL by a Super-Majority council vote. As verified by the City Attorney, the council-approved ordinance itself could be repealed by only 4 votes of the city council within just a few weeks at any time in the future. Links to the hearing video, public comment video and the agenda documents are below. Sunnyvale Measure M amends municipal code to require voter approval before the sale, lease, swap or transfer between the City and another party of property owned, leased or used by the City as a public park or community service amenity, which includes facilities and land whose primary purpose is to provide the public a place of city government administration, recreation, education, exercise, or enjoyment. 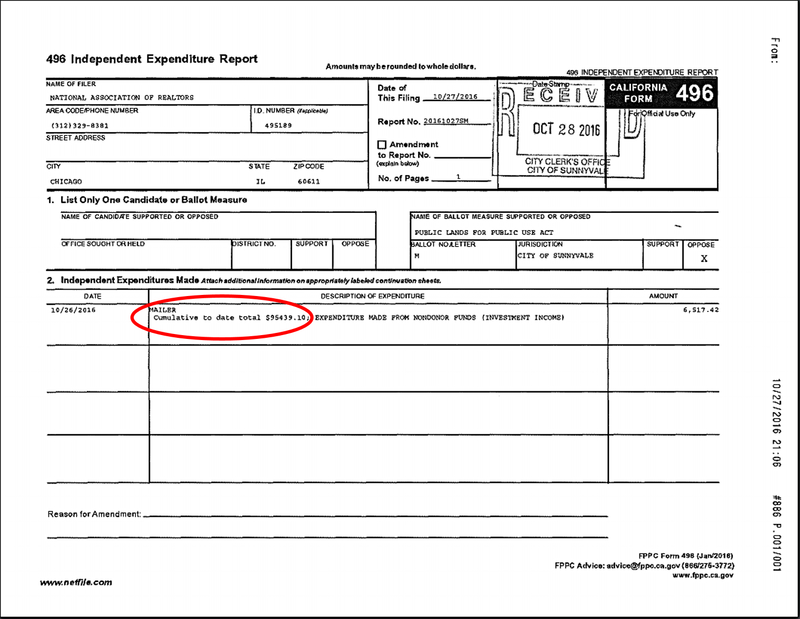 How would you feel if the nation’s second-largest super-PAC pumped money into defeating a Sunnyvale public land measure?The National Association of Realtors (NAR), has spent $95K to defeat Measure M–so far. It might interest you to know that the NAR is the public policy arm of a large group of real estate developers. Open Letter to Sunnyvale residents from Holly Lofgren urging a YES vote on Measure MI am a 32-year resident of Sunnyvale and supporter of Measure M. In that time, I have helped out my community in many ways. In 2002 I chaired the committee to build our 50-meter swimming pool at Fremont High School. I also chaired committees to raise funds for our wonderful local high school district and raised funds for many local charities. I did all these things because I believed in them. Our community is experiencing increased pressure to reallocate and re-purpose our Sunnyvale public lands for non-public uses. We as residents are feeling it, as well as our city officials. It’s becoming more and more difficult for our representatives alone to hold back this onslaught. Our residents and elected representatives need a new tool, something to help our city officials stem the pressures to change the character of our community without good community discussion and the backing of direct voter approval. This measure will allow the voters of the City of Sunnyvale to have a direct say by requiring a majority vote of Sunnyvale voters to approve the sale, lease, swap or transfer between the City and another party of city property that has been used as either 1) a public park, or 2) a community service amenity, which includes facilities and land whose primary purpose is to provide the public a place of city government administration, recreation, education, exercise, or enjoyment. The measure does NOT interfere with management of city services.